The bathroom is a core part of a house. Any human activity which inhabits the house always begins from this place. 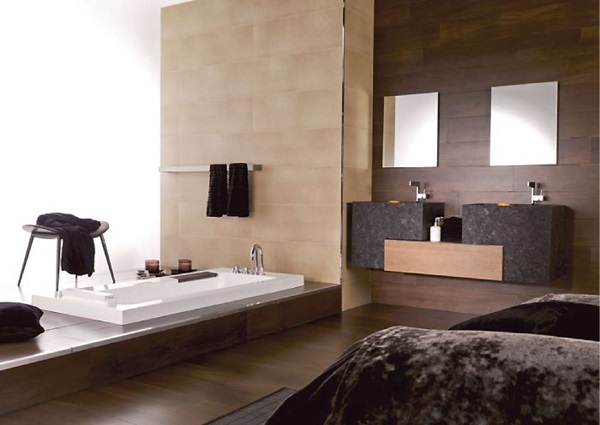 to build a good bathroom, comfortable, and healthy, there are some things that should be taken into consideration. Laying sanitaria fixtures in the bathroom should be regulated carefully. Suppose the sink is placed to the front so that when washing hands, we do not need to get into the inside of a bathroom or closet should not be placed after a wet floor area as it will look good and impress moist. Use fixtures such as faucets, shower, and floor drain are made from stainless steel because aside more robust, maintenance is likely to be easier when compared with other materials. Size of your bathroom depends on the available land. When your homes are large, you can make a big bathroom, but if the vast land of our homes is limited, so the bathroom should also be another factor is the activities undertaken in the bathroom. When the shower is used also as a place you love to dress up or maybe soak the bathroom size should be larger. 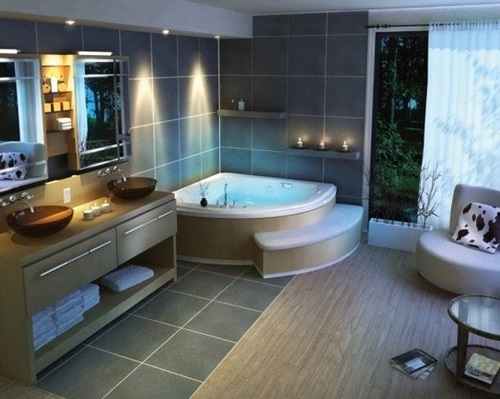 Go ahead if you prefer darker colors that most bathroomss have lighting enough. You can use halogen lamps in the corners of the room and add a wide mirror to neutralize narrow sense due to the effects of the dark color. Another thing to note is the use of textured ceramics unpolished rude or granite tile for flooring that is not slippery when wet. Ceramic wall should also be full up to the ceiling for the bathroom easy to clean. You should first determine whether you will make the bathroom dry or wet because if you want a dry bath, it must be separated for wet areas such as showers or baths and bath up dry area for a closet and sink. Separation of wet and dry areas can use the shower box or if want more simple it can be to use insulating glass. Where the development of germs so, if possible, so that the bathroom design can get sunlight, for example by using a transparent tile / glass blocks or other transparent materials translucent sun and also, to add to the aesthetic bathroom. If the wall tiles are used dark, the lighting should be brighter than if you use light colored tiles. You can add such local lights above the mirror-angle corner of the room or with indirect lighting (Indirect illumination) if you use a drop ceiling in the ceiling. For local lights you can use this type of yellowish halogen bulbs. Creating ventilation in the bathroom is also a key condition for the bathroom kept clean and healthy. If the bathroom was on the side walls are not in contact with the outer space, it must use the exhaust fan who throws dirty air through the ceiling. Therefore, as far as possible when designing a bathroom in house, located adjacent to the outdoor space should allow air to enter freely out so the bathroom not humid and stuffy. Air vents can be made by using the grating at the bottom of the door or in part the bathroom. After considering the above steps in designing your bathroom would not be difficult, right? « Why should Use home roof insulation?